EURUSD has been chiefly under the influence of the tensions between Turkey and the United States. The support rests at 1.13900 with resistance at 1.14360 which both lines are below the weekly pivot point at 1.14750. The EMA of 10 is moving with bearish bias in the descendant channel and it is below the EMA of 100 and the EMA of 200. The RSI is rising towards the 50 level, the Stochastic is moving in middle ranges and the MACD line is below the signal line in the negative territory. The ADX is not showing any clear signals. 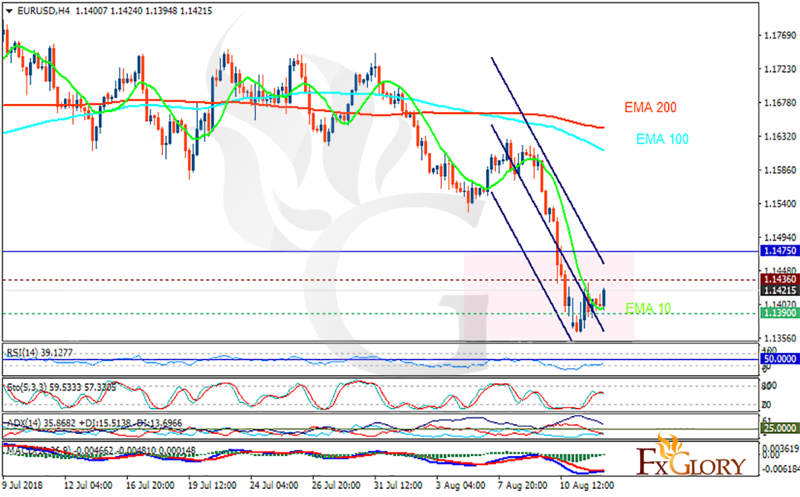 EURUSD is still in bearish zone, however, rising towards 1.15 will be a good sign for the correction pattern.